Yes, it’s true—you’ll actually save money by buying a new gas furnace in Winnipeg because your new model from Provincial Heating & Cooling will be more energy-efficient than the old furnace at your home. Imagine saving money on your monthly energy bills! When you’re seeking to replace your older model furnace, you’ll find a quality collection of brand new, state-of-the-art gas furnaces from reputable, name-brand companies. Our friendly, experienced and knowledgeable sales staff will be happy to assist you in selecting the right gas furnace to fit your needs. From homeowners to business owners and beyond, we take great pride in helping a wide range of customers find the perfect gas furnace. Our customer service is what sets us apart from other furnace companies Winnipeg residents may use. The Age of Your Unit – The approximate lifespan of a gas furnace is in the range of 16 to 20 years. Even if your unit has experienced a minimal amount of issues, it’s time to start looking around for a new one, as the energy efficiency of your current gas furnace has likely plummeted and will continue to drop significantly month by month. Constant Repairs – As with high energy bills, it’s senseless to pay for constant repairs. If you’ve found that you’re frequently calling the furnace repair technician, it’s time for a new gas furnace. 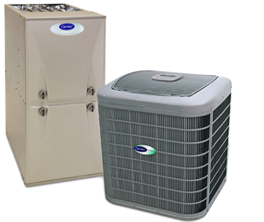 If efficiency is a hot button for you, but budget is your primary concern, consider our Comfort 90+% AFUE gas furnaces. These high-efficiency furnaces excel at generating warmth throughout your home—while generating low energy bills though those long winter months. If you’ve found it’s time to replace your unit, visit Provincial Heating & Cooling in Winnipeg for a gas furnace for sale. We encourage you to book an appointment by visiting our contact page, where you’ll find our phone number and additional information! We look forward to helping you select your new gas furnace! I emailed them late one evening about having an annual service inspection done. I got an initial email reply within minutes of me sending in my email last night. This morning I got an appointment booking phone call. I got the “we are on our way” call from the service tech 20 minutes before they arrived. After the work was done I got a detailed explanantion of what was done to the furnace & the technician patiently answered all my questions. A job well done….Super Service!!!! !